Grammar was a subject that I oddly enjoyed growing up. Sentence trees, spelling contests, pop spelling tests–I was all about it. I very rarely misspell, except for that one time where I was so excited that I was one of only two students standing in the second grade spelling contest, that I blurted out “K’ instead of “C” when the teacher said “Ify, your word is calender.” (She ain’t like me anyways…). When we got to punctuation usage, I was like Black Shakespeare, man. Stopping sentences with abrupt dashes; getting around run-on sentences with semi-colons; and using exclamation points sparingly (‘cuz even back then, I knew that there wasn’t that much to be so freakin’ excited about…chill). No matter where you were raised, it is uniformly known that a “period” is a full-stop, while a “comma” means there is more to the story. Or how many of us have seen that period in your educational career–whether due to grades, financial aid, or tragedy–magically transform into a comma when a guidance counselor, financial aid adviser, or family member stepped in. Number One: God has an ULTIMATE plan for you. Why is this important? Because He will do, or allow, WHATEVER is necessary to happen…in order that you reach that plan. This means that even some good things will be aborted. This also means that some hardships may have long cycles. Even though we may think we are the captain of our ship, our vision of what’s ahead is often short-sighted. God is the real Captain, and the insertion of periods and commas are there to get us to several destinations that otherwise we’d miss without the right punctuation. 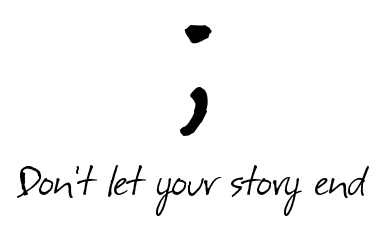 Number Two: Sometimes, we misinterpret the periods for commas or semi-colons…and vice-versa. When I am unable to pay a bill, I get really really frustrated. Like, I literally start going through a “woe is me” kind of whirlwind, wondering why I can’t ever be in a place where my “milk and honey” flow isn’t stop by a PERIOD! But I also realize that the “period” is not only a stop–it’s a pause. At moments of loss, lack, and grief, God presents an opportunity to think of what changes we can make before moving on. For me, it meant reassessing finances, planning for bills a little differently, and finding other revenues of income. Slowly, and in partnership with God, instead of me asking for the “period” to change into a “comma,” He helped craft a brand new sentence–thus walking into newness without the baggage of unhealthy habits. Number Three: As long as you have breath, you are in a “comma.” If you made it this far, there is more to go. Outfitting your mind with a bunch of ,,,,,,,,,,,,,,,,,,,,,,,,,,,,,,,,,,,,,,,,,,,,,,,, allows you to focus on the next thing in store for you. Remember that every new sentence comes after a period. Punctuating one’s life–or identifying which punctuation to apply–can, at times be difficult. It’s a task not solely determined by you. But if you believe that God has more in store for you than you can even imagine, then the brief pauses should serve as reminders that He is STILL working in your life. This entry was posted in Thursdays with Ify and tagged commas, God, grammar, moments, pause, periods, reflection, sentence. Bookmark the permalink.